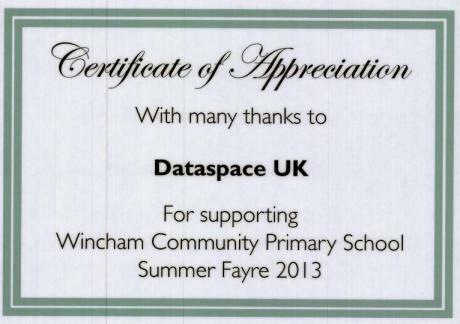 Here at DataSpace we care about the Community and love local community events. Last Summer we were approached by our local Primary School, Wincham Community Primary School they required prizes for their annual Summer Fayre. DataSpace were pleased to contribute and we proudly donated a lovely Harrods Hamper. ” Thank you so much for supporting the Summer Fayre again this year. We really appreciate your prize donation to our Grand Draw raffle. We have finalised the accounts and are delighted to announce that we raised £6,500! This is more than we have ever raised before which is a fantastic result and will enable more funds to be made available for the benefit of the school children.